How Important Is Your PHYSICAL Life? WE are ready, now, to search out the actual location of the lost tribes of the outcast House of Israel. We know they exist today as a nation, and a company of nations, powerful, looked upon as Gentiles. And when we find them, we shall find the throne of David! The prophet Amos wrote, in the days of the 13th of the 19 kings of the House of Israel (Amos 1:1): "Behold the eyes of the Lord are upon the sinful kingdom [House of Israel — Judah had not yet sinned], and I will destroy it [the kingdom, or government, not the people] from off the face of the earth ... For, lo, I will command, and I will sift the House of Israel among all nations, like as corn is sifted in a sieve, yet shall not the least grain fall upon the earth" (Amos 9:8-9). This prophecy usually is applied to the scattered condition of the Jews. But it has nothing to do with the Jews, or House of Judah, but refers to the ten-tribed House of Israel — driven to Assyrian captivity, then migrating from there and scattering among other nations before the Jews were taken to Babylon. This prophecy says that Israel, (not Judah), was to be sifted among other nations — these Israelites losing their identity — yet God has protected and kept them — "not the least grain shall fall upon the earth." It was during this time that the children of the House of Israel were to "abide many days without a king" (Hosea 3:4). That these people did sift through all nations is clear. Many New Testament passages indicate this. Although many of them still were scattered among various nations in the first century, A.D., a portion of them had become established in a definite location of their own by Jeremiah's time — 140 years after their original captivity. But these Israelites who possessed the Birthright eventually were to come to a new land of their own. The Eternal says, in II Samuel 7:10, and I Chronicles 17:9: "Moreover, I will appoint a place for my people Israel, and will plant them [Jeremiah was commissioned to do the planting of the throne among them] that they may dwell in a place of their own and move no more" The context of the whole passage shows this refers, not to Palestine, but a different land where these scattered Israelites were to gather, after being removed from the promised land of Palestine, and while that land was lying idle and in possession of the Gentiles. Notice carefully! After being removed from Palestine, being sifted among all nations, abiding many days without a king, losing their identity, they are to be "planted" in a faraway strange land now to become their own. And, note it! — after reaching this place, they are to move no more! That is, of course, during this present world. Mark this clearly! Once this "place of their own" was reached, and the throne of David planted there, they were to move no more. Therefore, the location of this people TODAY is the place where Jeremiah planted David's throne more than 2500 years ago! Therefore prophecies pertaining to this day, or to the location of this people just prior to Christ's return, will tell us the location of Jeremiah's planting. The House of Israel is yet to return, at Christ's coming, to Palestine — yet to plant grapes in Samaria, their original country. Prophecies telling where they shall, in that future day, migrate from, will reveal the location of "lost" ten-tribed Israel! The two succeeding "overturns" of the throne, too, must be located in this same general locale. Without further suspense, let us see where prophecy locates these Birthright holders, now possessing the throne of David and having received earth's richest national blessings. Remember they are distinguished from Judah — the Jews — by various names, "Ephraim," "Joseph," "Jacob," "Rachel" (the mother of Joseph), "Samaria" (the former home), "Israel." According to Hosea 12:1: "Ephraim followeth after the east wind." An "east wind" travels west. Ephraim must have gone west from Assyria. When the Eternal swore to David to perpetuate his throne, He said: "I will set his hand [sceptre] in the sea" (Psalm 89:25). The throne is to be "set," planted, "in the sea." Through Jeremiah the Eternal said: "Backsliding Israel hath justified herself more than treacherous Judah. Go and proclaim these words toward the north and say, Return thou backsliding Israel, saith the Lord" (Jeremiah 3:11-12). Israel is clearly distinguished from Judah. Of course Israel was north of Judah while still in Palestine — but when these words were written by Jeremiah, Israel had been removed from Palestine more than 130 years — and had long since migrated, with the Assyrians, north (and west) of Assyria's original location. And in these last days messengers are to go "toward the north" (of Jerusalem) in order to locate lost Israel and proclaim this warning. So the location, we now find, is toward the north, also west, and in the sea. The 18th verse, same chapter, says: "In those days the house of Judah shall walk with the house of Israel [margin, to the House of Israel], and they shall come together out of the land of the north to the land that I have given for an inheritance unto your fathers." At the future Exodus, at Christ's coming, they are to return to Palestine out of the land of the north! After saying, "How shall I give thee up, Ephraim?" the Eternal, speaking through Hosea, says: "then the children shall tremble from the WEST" (Hosea 11:8, 10). Again : "Behold, I will bring them from the north country, and gather them from the coasts of the earth" (Jeremiah 31:8). This prophecy is for consideration in the "latter days" (Jeremiah 30:24; 31:1), and is addressed to "Israel" (verses 2, 4, 9), to "Ephraim" (verses 6, 9), and "Samaria" (verse 5). Here is added another hint — "the coasts of the earth" — evidently they are dominant at sea, and indicating they have spread abroad widely by colonization. Referring to the House of Israel (not Judah) in Isaiah 49:3, 6, God says: "Behold these shall come from far: and lo, these from the north and from the west; and these from the land of Sinim" (Isaiah 49:12). In the Hebrew, the language in which this was originally inspired, there is no word for "northwest," but this term is designated by the phrase, "the north and the west." It means, literally, the northwest! The Vulgate renders "Sinim" as "Australi," or "Australia." So we now have the location northwest of Jerusalem! And even spreading around the world. Hence, Israel of today — Israel of the day of Jeremiah's "planting" of David's throne — is located specifically as northwest of Jerusalem, and in the sea! The same 49th chapter of Isaiah begins with this: "Listen, O Isles, unto me." The people addressed, Israel, are called "O Isles" in the first verse and "0 Israel" in the third verse. This term "isles" and "islands" is sometimes translated "coastlands." The 31st chapter of Jeremiah, locating Israel in the "north country" says: "I am a father to Israel, and Ephraim is my firstborn. Hear the word of the Lord, O ye nations [Ephraim, Manasseh] and declare it in the isles afar off..." (Jeremiah 31:9-10). Again: "Keep silence before me, O islands... thou, Israel, art my servant Jacob whom I have chosen" (Isaiah 41:1, 8). In Jeremiah 31:7, the message to be declared "in the isles afar off" (verse 10), is to be shouted in "the chief of THE NATIONS." So, finally, today, as in Jeremiah's day, the House of Israel is in the isles, which are "in the sea," the chief of the nations, northwest of Jerusalem! A coast-dwelling, and therefore sea-dominant people. Take a map of Europe. Lay a line due northwest of Jerusalem across the continent of Europe, until you come to the sea, and then to the islands in the sea! Of proof that our white, English-speaking peoples today — Britain and America — are actually and truly the Birthright tribes of Ephraim and Manasseh of the "lost" House of Israel, there is so much, we shall have space for but a small portion in this book. A most interesting fact is the Hebrew meaning of the names of the British people. The House of Israel is the Covenant People. The Hebrew word for "covenant" is benyth, or berith. After Gideon's death, Israel followed the false pagan god Baal. In Judges 8:33, and 9:4, the word "covenant" is used as a proper name coupled with the name "Baal." This is quoted in the English text, Authorized Version, without being translated, as "Baalberith," meaning (margin) "idol of the covenant." The Hebrew for "man" is iysh, or ish. In English, the ending "-ish" means "of or belonging to (a specified nation or person)." In the original Hebrew language vowels were never given in the spelling. So, omitting the vowel "e" from berith, but retaining the "i" in its Anglicized form to preserve the "y" sound, we have the Anglicized Hebrew word for covenant, brith. The Hebrews, however, never pronounced their "h's." Many a Jew, even today, in pronouncing the name "Shem," will call it "Sem." Incidentally, this ancient Hebrew trait is also a modern British trait. So the Hebrew word for "covenant" would be pronounced, in its Anglicized form as brit. And the word for "covenant man," or "covenant people," would, therefore, be simply, "beit-ish." 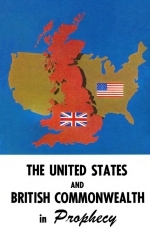 And so, is it mere coincidence that the true covenant people today are called the "British"? And they reside in the "British Isles!" To Abraham, God said, "In Isaac shall thy seed be called," and this name is repeated in Romans 9:7 and Hebrews 11:18. In Amos 7:16 they are called "The House of Isaac." They were descended from Isaac, and therefore are Isaac's sons. Drop the "I" from "Isaac" (vowels are not used in Hebrew spelling), and we have the modern name, "Saac's sons," or, as we spell it in shorter manner, "Saxons!" Dr. W. Holt Yates says, "The word 'Saxons' is derived from the 'sons of Isaac,' by dropping the prefix 'I.'" Many confuse the Anglo-Saxons with the German or Old Saxons who still live in Germany. The German Saxons derive their name from an Old High German word, Softs meaning "sword" or "knife." These sword-carrying Germans are an entirely different people from the Anglo-Saxons who migrated to Britain. As the Eternal intended that "lost" Israel was to be located and found in these last days, we should expect some kinds of signs or waymarks to have been left along the trail by which ancient Israel journeyed from Assyria, the land of their original captivity. Speaking to Ephraim (verse 20), the Eternal says in Jeremiah 31:21: "Set thee up waymarks, make thee high heaps; set thine heart toward the highway, even the way which thou wentest." In Scripture we find the "waymarks," or highway signs which they set up along the road they traveled. In Genesis 49:17, Jacob, foretelling what should befall each of the tribes, says: "Dan shall be a serpent by the way." Another translation of the original Hebrew is: "Dan shall be a serpent's trail." It is a significant fact that the tribe of Dan, one of the Ten Tribes, named every place they went after their father, Dan. The tribe of Dan originally occupied a strip of coast country on the Mediterranean, west of Jerusalem. "And the coast of the children of Dan," we read in Joshua 19:47, "went out too little for them: therefore the children of Dan went up to fight against Leshem, and took it... and called Leshem Dan, after the name of Dan their father." In Judges 18:11-12, it is recorded that Danites took Kirjath-jearim, "and called that place Mahaneh-dan unto this day." A little later the same company of 600 armed Danites came to Laish, captured it, and "they called the name of the city Dan, after the name of Dan, their father" (verse 29). So notice how these Danites left their "serpent's trail" by the way — set up waymarks by which they may be traced today. Remember, in the Hebrew, vowels were not written. The sound of the vowels had to be supplied in speaking. Thus, the word "Dan" in its English equivalent, could be spelled, simply, "Dn." It might be pronounced as "Dan," or "Den," or "Din," or "Don," or "Dun" — and still could be the same original Hebrew name. The tribe of Dan occupied two different districts, or provinces, in the Holy Land before the Assyrian captivity. One colony lived on the seacoast of Palestine. They were principally seamen, and it is recorded "Dan abode in ships" (Judges 5:17). When Assyria captured Israel, these Danites struck out m their ships and sailed west through the Mediterranean, and north to Ireland. Just before his death, Moses prophesied of Dan: "Dan is a lion's whelp; he shall leap from Bashan" (Deuteronomy 33:22). Along the shores of the Mediterranean they left their trail in "Den," "Don," and "Din." Irish annals and history show that the new settlers of Ireland, at just this time, were the "Tuatha de Danaans," which means, translated, "Tribe of Dan." Sometimes the name appears simply as "Tuatha De," meaning the "People of God." And in Ireland we find they left these "waymarks": "Dans-Laugh," "Dan-Sower," "Dun-dalke," "Dun-drum," "Don-egal Bay," "Don-egal City," "Dun-glow," "Lon-don-derry," "Din-gle," "Duns-more" (meaning "more Dans"). Moreover, the name "Dunn" in the Irish language means the same as "Dan" in the Hebrew: "Judge." But the northern colony of Danites were taken to Assyria in the captivity, and thence with the rest of the Ten Tribes they traveled from Assyria by the overland route. After leaving Assyrian captivity, they inhabited for some time the land just west of the Black Sea. Then we find the rivers "Dnieper, Dniester, and the Don." Then, in either ancient or later geography, we find these waymarks: Dan-au, the Dan-inn, the Dan-aster, the Dan-dari, the Dan-ez, and Don, the Dan, and the U-don; the Eri-don, down to the Danes. "Denmark" means "Dan's Mark." When they came to the British Isles, they set up the "way-mark" names of Dun-dee, Dun-raven, in Scotland and the Dans, Dons and Duns are as prolific as in Ireland. And so the "serpent's trail" of Dan sets up waymarks that lead directly to the British Isles! Now briefly let us consider what is found in the ancient annals, legends, and history of Ireland, and we shall have the scene of Jeremiah's "planting," and the present location of 'lost" Israel. Long prior to 700 B.C., a strong colony called "Tuatha de Danaan" (tribe of Dan) arrived in ships, drove out other tribes, and settled there. Later, in the days of David, a colony of the line of Zarah arrived in Ireland from the Near East. an elderly, white-haired patriarch, sometimes referred to as a "saint," came to Ireland. With him was the princess daughter of an eastern king and a companion called "Simon Brach," spelled in different histories as "Breck," "Berech," "Brach," or "Berach." The princess had a Hebrew name "Tephi" — a pet name, her full name being "Tea-Tephi." Modern literature of those who recognize our national identity have confused this Tea-Tephi, a daughter of Zedekiah, with an earlier Tea, a daughter of Ith, who lived in the days of David. This royal party included the son of the king of Ireland who had been in Jerusalem at the time of the siege. There he had become acquainted with Tea-Tephi. He married her shortly after 585 — when the city fell. Their young son, now about 12 years of age, accompanied them to Ireland. Beside the royal family, Jeremiah brought with them some remarkable things, including a harp, an ark, and a wonderful stone called "lia-fail," or "stone of destiny." A peculiar coincidence (?) is that Hebrew reads from right to left, while English reads from left to right. Read this name either way — and it still is "lia-fail." Another strange coincidence — or is it just coincidence? — is that many kings in the history of Ireland, Scotland, and England have been coronated sitting over this stone — including the present queen. The stone rests, today, in Westminster Abbey in London, and the Coronation Chair is built over and around it. A sign beside it labels it "Jacob's pillar-stone" (Genesis 28:18). this same dynasty continued, unbroken, through all the kings of Ireland; was overturned and transplanted again in Scotland; again overturned and moved to London, England, where this same dynasty continues today in the reign of Queen Elizabeth II. The crown worn by the kings of the line of Herremon and the other sovereigns of ancient Ireland had twelve points! In view of the linking together of Biblical history, prophecy, and Irish history, can anyone deny that this Hebrew princess was the daughter of King Zedekiah of Judah, and therefore heir to the throne of David? — That the aged patriarch was in fact Jeremiah, and his companion Jeremiah's scribe, or secretary, Baruch? — And that King Herremon was a descendant of Zarah, here married to the daughter of Pharez, healing the ancient breach? — That when the throne of David was first overturned by Jeremiah, it was replanted in Ireland, later overturned a second time and replanted in Scotland, overturned a third time and planted in London? When Christ returns to earth to sit on that throne, He shall take over a live, existing throne, not a nonexistent one (Luke 1:32). And the British Commonwealth of Nations is the only company of nations in all earth's history. Could we so exactly fulfill the specifications of the Birthright, and not be the Birthright people? From the prophetic blessings passed on by the dying Jacob, it is apparent that Ephraim and Manasseh were in a large measure, to inherit the Birthright jointly; to remain together for a long time, finally separating. In Genesis 48 Jacob first passed the Birthright on to the two sons of Joseph jointly, speaking of them both together. Then, finally, he spoke of them separately — Manasseh was to become the single great nation, Ephraim the company of nations. And in his prophecy for these latter days Jacob said, "Joseph is a fruitful bough, even a fruitful bough by a well, whose branches run over the wall" (Genesis 49:22). In other words, Joseph — Ephraim and Manasseh jointly and together — was to be a colonizing people in this latter day, their colonies branching out from the British Isles around the earth. Our people have fulfilled this prophecy. Together Ephraim and Manasseh grew into a multitude, then separated, according to Jacob's prophetic blessing of Genesis 48.
forefathers were to be sifted through many nations, as corn through a sieve, yet not a grain to fall to the earth, or be lost (Amos 9:9). Our people did filter through many nations. Ephraim and much of Manasseh finally immigrated to England together, but many others of Manasseh who had filtered into and through other nations did not leave them until they came, as immigrants, to the United States after the New England colony had become the separate nation. This does not mean that all foreigners who have immigrated into this country are of the stock of Manasseh, but undoubtedly many are. Israel, however, always did absorb Gentiles, who became Israelites through living in Israel's land and intermarrying. Thus we have become known as the "melting pot" of the world. Instead of refuting our Manasseh ancestry, this fact actually confirms it. The proof that we are Manasseh is ovemhelming. Manasseh was to separate from Ephraim and become the greatest, wealthiest single nation of earth's history. We alone have fulfilled this prophecy. Manasseh was, in fact a thirteenth tribe. There were twelve original tribes. Joseph was one of these twelve. But when Joseph divided into two tribes and Manasseh separated into an independent nation, it became a thirteenth tribe. While the Birthright was Joseph's, and its blessings have come to the British Commonwealth of Nations and the United States of America, yet the other eight tribes of the House of Israel were also God's chosen people. They, too, have been blessed with a good measure of material prosperity — but not the dominance of the Birthright. identity of all these other tribes in the nations of our twentieth century. Suffice it to say here, that there is ample evidence that these other eight tribes have descended into such northwestern European nations as Holland, Belgium, Denmark, northern France, Luxembourg, Switzerland, Sweden, Norway. The people of Iceland are also of Viking stock. The political boundaries of Europe, as they exist today, do not necessarily show lines of division between descendants of these original tribes of Israel.